Countertop water filter is one of the best water filtration systems available for families for both small and large households. This water filtration system has several benefits such as easy installation efficient removal of toxic chemicals and water contaminants, etc. Generally, this system can employ one or two filtration processes. Also, countertop water filters have the capacity to reduce or remove various water contaminants or toxic elements such as chlorine, sediment, rust, lead, mercury, chemicals, bacteria, parasites, etc. Besides, this type of filtration system will keep the beneficial water minerals intact. However, in stark contrast to this situation, most of the other water filters are not able to keep the beneficial water minerals intact. So, let’s move forward and explore the best countertop water filters. What Is Counter Top Water Filter? 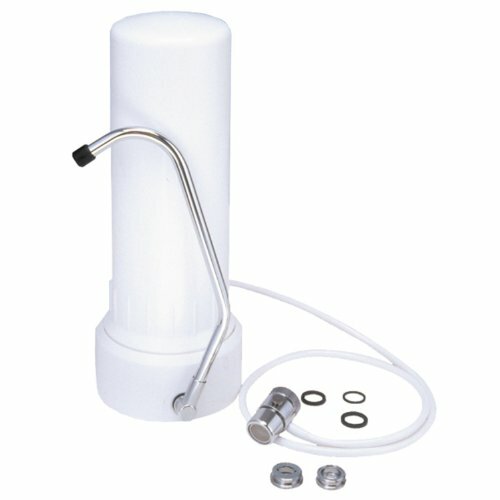 How Does Counter Top Water Filter Work? 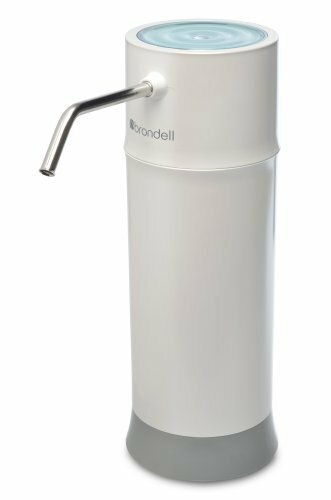 Brondell is a water filter with an elegant design and it is created with a single countertop filter system that is easy-to-install. This filter has the best in-class filtration system, which is equipped with powerful carbon block filtration technology. The performance of the filtration system is only found in the undercount system and you can filter water in less than 10 minutes. It employs a patented carbon-block filter that has advanced inner core for reducing the industrial chemicals pesticides, herbicides, volatile organic compounds rapidly. Also, it removes bad odor and taste from your water and makes it pleasant for drinking. You can install the unit within 10 minutes and it is easily fitted with 99% of standard home faucets. This counter top filtration system is built with an advanced multi-stage granular filter, which provides excellent water purity capacity. It can remove up to 93% of chlorine, fluoride, arsenic along with other chemicals. There is a compression disk at the inlet, outlet as well as between layers. Also, it is entirely filled up so that the water can’t bypass the filtration media. Furthermore, the design of the filter is space consuming and you can install the unit quickly. You would need to change the filter cartridge every six months or after filtering 500 gallons. iSpring has the capacity to remove sand, silt, sediment along with rust from your tap water and it can effectively remove bad taste and odor from your water as well. The system comes up with a portable design and the installation is quite easy. Compared to Watts 500315, it will consume a few spaces of your house, making it a better choice. Furthermore, the filtration system employs a coconut-shell carbon block technology th at is well-suited to camping, RVs, apartments, and houses. There are universal parts that can be easily replaced. This system comes with a kit that includes – filter housing with countertop stand, tubing for installation, wrench, carbon block filter, dispensing spout, diverter valve, and manual. 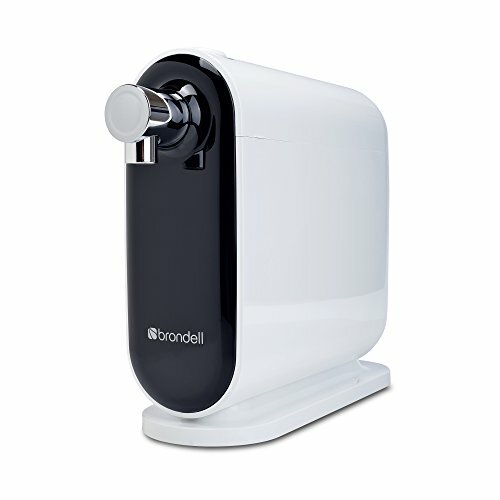 This model of Brondell has a unique combination of sleek design with powerful triple filtration technology. It is equipped with three different advanced filters – a Composite Plus filter, a Nanotrap filter, and a carbon block filter. It can effectively remove VOCs, herbicides, microorganisms, harmful chemicals, bad odors, and tastes. In order to fit with most of the faucets, the unit has a faucet diverter. You can install the system within 10 minutes and afterwards, you will get perfect water from your tap. Additionally, this system can be connected under the sink, but you would need to buy an extra T-valve. Also, it does not consume much after installation and this is certified and tested by WQA. New Wave Enviro is built with a 10-stage filter that can successfully remove almost all the key water contaminants. This countertop filter is able to remove the following contaminants – chlorine, giardia, heavy metals, lead, asbestos, bad odors, carcinogenic organic, and chlorine compounds, etc. Also, this filter will keep the beneficial water minerals such as magnesium and fluoride. Furthermore, you can replace the filter and effectively produce up 1500 gallons of water. The design of the unit is quite simple and you can easily attach it to the faucet. If you want to mount the filter under the sink, then you can buy an alternative and separate conversion kit. 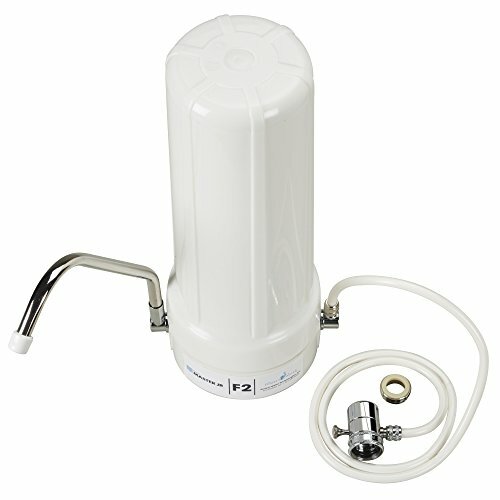 Watts 500315 is a countertop water filter that is renowned for its portable design. It can either be used in the home or in RV and camping. The installation process is very easy and the system can be connected with the faucet by a diverter valve. The filter uses a coconut shell carbon filter, which provides high-quality drinking water. It has the capacity to remove sediment, silt, rust, sand, chloramine, chlorine taste and odors from water and consequently, it can make water more pleasant as well. The lifecycle of the filter is six month and afterwards, you can replace the filter with any kind of standard 10-ibch filter element. This new edition of DuPont WFFS150XCH is an innovative water filtration system that is easy-to-install and you can mount it at any open hole in the sink. Regardless of the faucet, it will provide you with great quality water and it includes an electronic filter life meter, which will you give an indication of when the filter should be replaced. The unit comes with a 100-gallon filter cartridge and it can reduce sediment, chlorine, cysts, benzene, asbestos, lead, lindane, and mercury. Also, the product includes an Antimicrobial product protection that is built-in with cartridge housing and media for increasing the filter life as well as performance. A built-in faucet, a kitchen faucet adapte, and 1/4-inch plastic tubing along with mounting hardware are included in the package. Blupure eco-friendly is a 13 stage countertop water filter that can easily remove water contaminants such as chlorine, lead, mercury, bacteria, sulfide, radiation, fluoride, and chloramine. 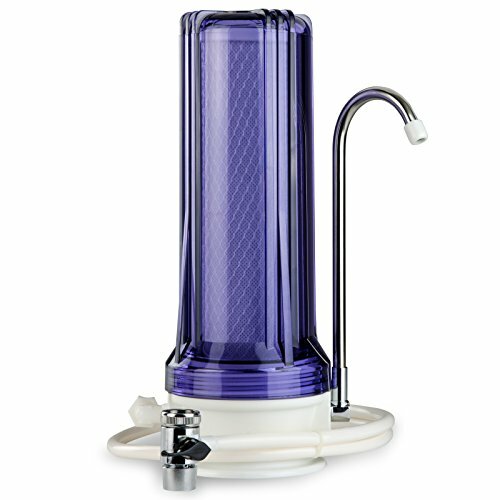 This water filter will eliminate odor and bad taste from water; consequently it will make the water pleasant for drinking. Typically, Blupure is provided with a pre-installed filter cartridge, which will reduce a lot of hassle of replacing filter cartridge. Also, the unit comes with a compact design and it is not a large one. So, you don’t need big spaces to install it. All in all, this is a good water filter to have inyour home. Generally, the countertop water filters are widely popular water filters that are being used by many people in their home or office. 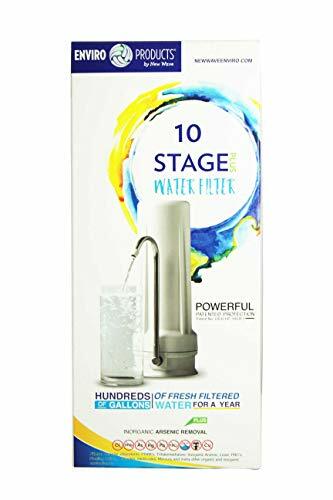 The reason for this popularity is that it can effectively remove or clean water contaminants and, as a result, it will provide you with fresh drinking water. These water filters use several kinds of filtration method in removing the harmful toxic elements from water and some of the filters even employ multiple filtration technologies to reduce the impurities. Furthermore, some countertop water filters utilize a selective filtration process, which means the uncontaminated elements will be removed and at the same time, the beneficial minerals of water will be kept intact. So, you can expect enjoyable drinking experience with countertop water filters. A countertop water filter is more effective than other water filter units. You would be required to put in a little effort while installing the unit and the portability of the filters make them a preferred choice over other systems. Also, the faucet’s aerator is replaced by a diverter valve and the installation process ends here. Just screw off the aerator, screw on the diverter valve and the system is ready to filter water. Now, for operating the filter, you only need to turn on the cold water faucet and permit water to run into the sink. Afterwards, insert the small knob on the diverter valve. Furthermore, this will direct the water from the sink faucet to the water filter housing and in doing this; the water will pass through a small tube. Within the housing, there is a filter cartridge in which the water will pass through. After that, the water will then leave the filter and go into the spout. From that point, the container will be filled with water. For turning off the filter, you need to switch off the cold water faucet and the diverter valve will pop back into place while restoring the sink faucet to its usual operation. The advanced models will employ a blend of filtration processes with multiple stages. It results in an effective removal of water contaminants. The filtration is very easy and rapid. The overall installation process is very simple and easy. The filter life is up to one year. The prices of countertop water filters are affordable. Despite having several positive facts, the countertop water filters are not faultless. There are some models that can’t be fitted with all the faucets. In that case, an adapter would be needed. Although almost all the designs of the water filters are compact, they would still command a few countertop spaces. To finish off, I would emphasize you to buy a countertop water filter because they are worthy of spending money. Also, they would bring you the much-needed pure water that everybody crave for and keep in mind that they also have one of the best filtration methods compared to other systems. So, buy countertop water filter and enjoy drinking pure water.